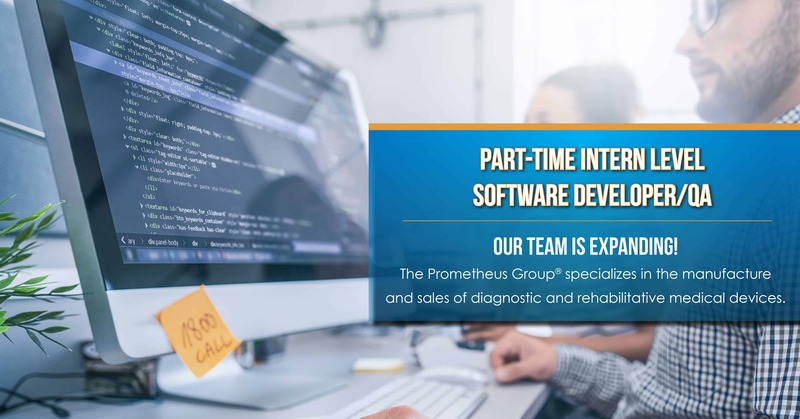 Start Your Career with The Prometheus Group® and Apply Today! The prospective candidate will start out in a contractual role where their schedule will be formulated from their current availability. The candidate will be mentored and assessed directly by the Software Development Manager. Once the candidate becomes available for full-time work and demonstrates an aptitude for software development, a full-time employment package will be negotiated with them. To optimize their chances for success, the candidate should possess a positive and motivated attitude, the ability to understand and complete the tasks they are assigned, and excellent attendance. New Entry-Level Development Intern to provide project assistance. Collaborate with Software Development Manager and Engineering Director to establish priorities and direction. Capacity to learn and evolve the skills necessary for commercial software application development. Current enrollment in Computer Science/ Mathematics/ Engineering program. Mathematical problem solving, superior attention to accuracy and detail. Excellent verbal, written, computer and technical communication skills, including Microsoft Operating System and Office. The ability to learn quickly and work effectively in a fast-paced environment. Proven ability to foster positive and professional relationships at multiple levels and to work independently as well as in a team. Testing of medical devices and software. The successful candidate will have a strong desire and capability to learn new skills and follow instructions. Willingness to be mentored by seasoned professionals with potential for educational assistance.